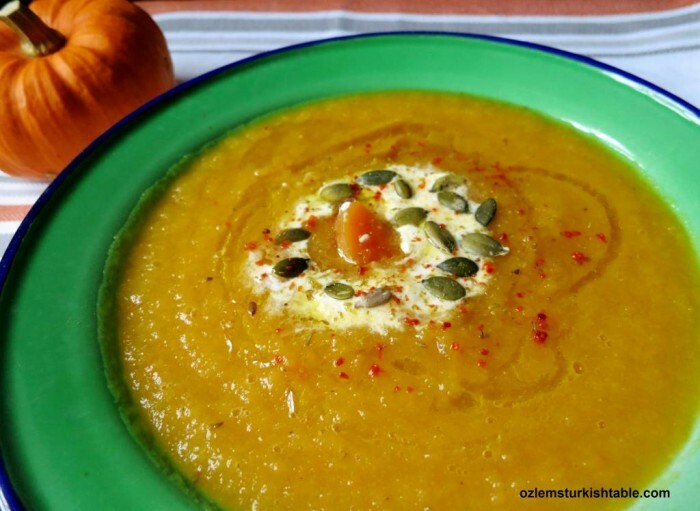 This easy, delicious pumpkin soup flavored with spices and yoghurt, is a real winter warmer. I mildly flavored our pumpkin soup, Balkabagi Corbasi, with ground cumin and red pepper flakes. Adding plain yoghurt at the end gives a lovely creamy texture and a bit of tartness, really delicious and wholesome. Hope you enjoy it, Afiyet Olsun. Clean, peel and deseed the pumpkin and cut in small chunks. Put the pumpkin chunks, onions and cubed carrots into a heavy pan. Pour in the stock and olive oil. Then bring the pan to the boil. Reduce the heat, cover the pan and simmer for about 25 minutes, or until all the vegetables are cooked. Puree the soup in a blender and return to the pan. Over a low heat, season with salt, freshly ground black pepper, ground cumin and red pepper flakes or chili flakes. Combine well and turn the heat off. Pour the soup into serving bowls. Swirl a tablespoonful of plain yoghurt over. Sprinkle a few sunflower seeds or roasted pumpkin seeds, as well as little red pepper flakes and ground cumin, if you like. I also like to drizzle a little extra virgin olive oil over the soup before serving.